Find us at 120 Main St.
or keep up with us on Facebook. See our calendar below for meeting dates and museum hours. Please keep in mind that we are not open year round or daily. Since our snowbirds have flown south, we've cancelled meetings this winter. See you in March! Whether you’re a new visitor or a faithful returning one, we welcome you to our website. See our blog post for information about how you can participate (or what you can look forward to) with our new exhibit. We opened the Westphalia Historical Society Building and Museum in 2014. Each year from Memorial Day to the first weekend in December we have themed exhibits in our building. If you take a tour of our website, you'll find pictures and information about what types of exhibits we've done in the past. In 2017, after a great Our Town exhibit, we decided to dedicate part of our building to a permanent exhibit dedicated to Our Town. By doing this, whenever you visit our building you'll have an opportunity to visit a little bit of our past while also getting to see something new, as the rest of the building is now a themed exhibit that rotates yearly. Our little museum is a great size for our little village and surrounding areas. Our past exhibits have been school days, veterans, and Westphalia history. Flip through our photos to see what you can find. Keep in touch to find out what we'll be having next. Not sure what to expect if you attend a Cemetery Walk? ​See our blog for a great explanation about how long to expect to be there, what to expect while you're there and more. We also post pictures and stories from our past Cemetery Walks on the blog. We are excited to have made this a yearly event on the first Saturday of December. Our little parade goes down Main Street, starting east of "four corners", ending at the Historical Society Museum. Each year we have a person of honor "flip the switch" on the tree. St. Nikolaus joins us as well, in true German tradition in honor of the upcoming feast day. Local businesses open with specialties, treats and fun. ​Take a look at our Blog Posts for pictures of our little event over the years. ​We are currently suspending further requests for genealogy information. Thank you for your patience with us. You can check out the resources on our Research Page or contact the Clinton County Historical Society for assistance or their archives. We have many pictures of our building and our village and its past; take some time to look around our website to see more. Meetings: Interested in attending a meeting? Meetings are held the the third Tuesday of the month at the historical society building at 6 PM. We do skip a few months in the winter, so check with a board member if you're not sure if we are meeting or not. Membership is $5.00, but you need not be a member to attend. Newsletter sign up: Would you like newsletters sent to you? See the NEWSLETTERS page. Did You Know that you don't need a Facebook account to see our page? Click on the "F" icon on any page (or this link). If you do have an account, please LIKE us! We use the page to promote upcoming events, showcase pictures and facts about the past. ​Considering donating? Fill out the back page of our brochure and turn it in. Many thanks to all who have donated thus far. 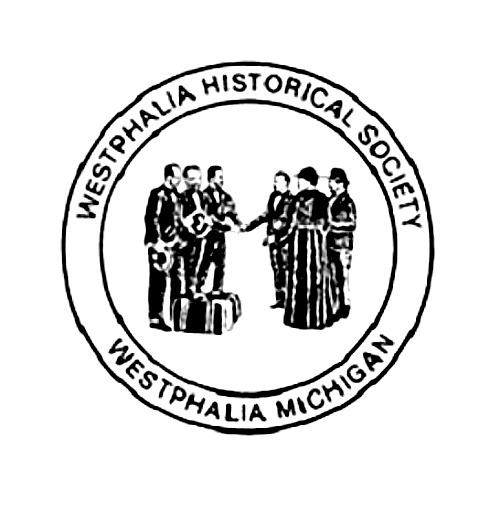 ​The Westphalia Historical Society is a 501(c)3 nonprofit organization and donations are tax deductible. We are currently suspending further requests for genealogy information. Thank you for your patience with us.